US President Donald Trump’s newly-signed executive order that temporarily bans the citizens of seven Muslim-majority nations from entering the US has sparked criticism around the globe. The Netherlands has frozen negotiations with the US on cooperation between the two nations’ border control authorities, which were aimed at allowing people travelling to the US from Amsterdam pass through US-authorized border control in the Dutch capital to avoid waiting in lines once they arrive in the US. The Dutch government said it did not see the possibility for continuing talks in light of the travel ban imposed on seven predominantly Muslim countries by the Trump administration – a policy which Amsterdam considers discriminatory. Indonesian Vice President Jusuf Kalla has strongly criticized the travel ban, saying that Trump’s policy can raise “suspicion” toward Muslims. “[The ban] won’t affect us directly in a big way, but it can raise suspicion especially toward Muslims,” Jusuf Kalla told news website Detik.com, as cited by Reuters. Indonesia was not included in the list of banned counties. “Unfortunately, I am of the opinion that rising Islamophobia, xenophobia and anti-immigrant feelings have a great weight on this decision. Taking such a decision in a country like America, where different ethnic and religious groups are able to co-exist is very offensive. This is not right,” he told Haberturk newspaper. Yates, an Obama appointee, is expected to be replaced by Trump's pick, Senator Jeff Sessions (R-Alabama), in the near future. Meanwhile, courts in California, Massachusetts, New York, Virginia and Washington state have already been presented with cases challenging the order. READ MORE here. The rideshare app Uber, fending off a #DeleteUber hashtag campaign on social media, promises $3 million in legal defense funds for its drivers impacted by President Donald Trump’s executive order temporarily banning travel to the US from seven Muslim countries. The company upset many after advertising on Twitter during a taxi strike over the ban at New York’s JFK airport. Uber CEO Travis Kalanick announced the $3 million fund Saturday in a sponsored Facebook post targeting users interested in the American Civil Liberties Union. Co-founders of Uber’s chief competitor Lyft had announced earlier they would donate $1 million to the ACLU, following a backlash against Uber for running a Twitter ad promoting their services to JFK airport travelers as a taxi strike was ongoing. Kalanick is a member of a business advisory group for the Trump White House, a position that has already left Uber the target of anti-Trump protests. Australian nationals with a passport from one of the seven predominantly Muslim countries listed in US President Donald Trump’s temporary travel ban will be exempt, Australian Prime Minister Malcolm Turnbull said Tuesday. The Trump administration is facing mounting legal questions over the constitutionality of its executive order when it singled out seven Muslim-majority countries in its temporary travel ban. The Council on American-Islamic Relations sued Monday, saying the order violates the First Amendment's bar of preferential treatment for a religion, by appearing to favor Christian over Muslim refugees. 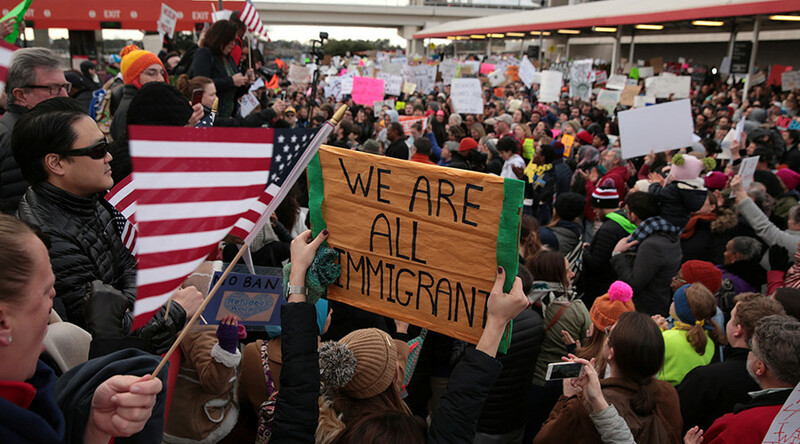 The ACLU is working on a lawsuit to challenge the executive order arguing that not only did it violate US international laws but violated the First Amendment and possibly violations for the Fifth, Sixth and Fourteenth Amendment by denying due process when Customs and Border Protections denied travelers access to an attorney. "The orders are very vague, and it has created a lot of confusion on the ground as well. Summarizing the executive order this is a ban on people of Muslim faith," Mariko Hirose, Senior Staff Attorney with New York Civil Liberties Union told reporters on Monday. Legal experts are divided as to whether courts will find Trump's action constitutional, but federal law gives the president broad power to restrict entry, particularly for national security concerns.